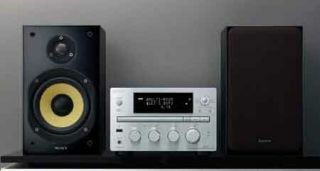 Sony introduces G Series micro system with AirPlay | What Hi-Fi? Sony has developed two alternatives for the micro hi-fi system market, its new conventional one-box CMT-G2BNiP (above) and the streamlined, wall-mountable CMT-CX5 (below). The £500 G Series has AirPlay built in as standard, so users can stream their music from iTunes on an iPhone, iPad or PC/Mac for playback on the Sony system. With wi-fi and an ethernet connection included, owners can choose between a wired or wireless connection to their home network. Music can also be played back from a USB stick or MP3 player via the USB port. Radio fans get a DAB/FDM/AM tuner, and of course internet radio stations can be streamed from your broadband network. Also making its debut is the £220 CMT-CX5, a wall-mountable CD system with DAB/DAB+/FM radio, USB connectivity and available in black or white. There's a built-in dock for iPod/iPhone, and Sony's Dynamic Sound Generator Xtra (DSGX) is said to create a... yes, you guessed it, "more dynamic sound".